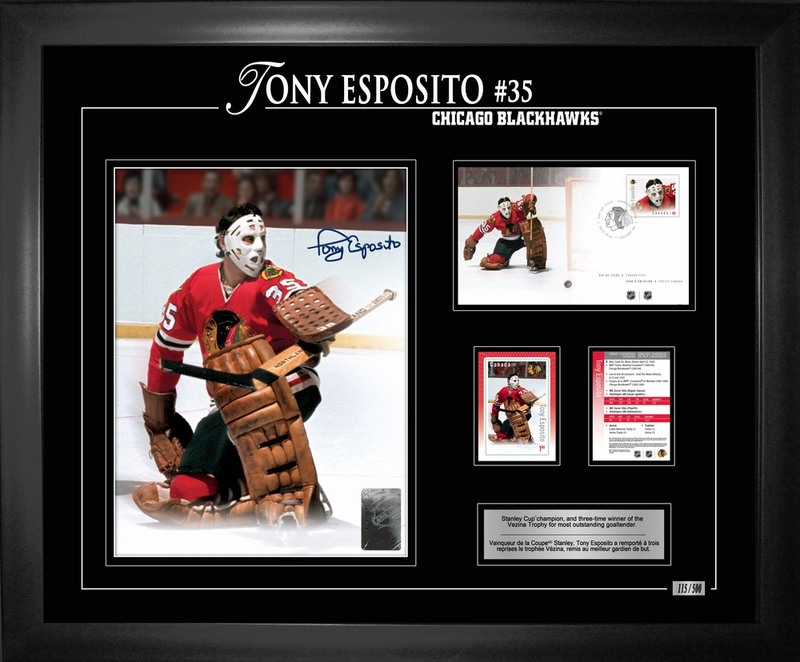 This limited edition frame was personally signed by Chicago goaltender, Tony Esposito. Esposito played 16 years in the NHL playing 886 games predominantly for the Chicago Blackhawks. Esposito retired with a career record of 423-306-152 posting a 2.93 GAA and .906SV% with 76 shutouts. Esposito won the Stanley Cup once in 1969 with Montreal before being traded to Chicago where he won a Calder Trophy for his rookie season. Over his 15 years in Chicago, Esposito won the Vezina Trophy 3 times. Esposito was inducted into the Hockey Hall of Fame in 1988 and was named one of the "100 Greatest Players of All Time" during the Centennial year of the NHL. There are 500 frames available for this limited edition series. This limited edition piece comes accompanied with a hologram and COA to ensure the authenticity of the signature.